Reproduced courtesy of the Library of Congress. When he formed Hewlett-Packard (HP) with his partner William "Bill" Hewlett (1913-2001), David Packard honored his personal pledge to advance science and technology. HP introduced several innovative products, including the handheld calculator and the ink-jet printer. It also influenced other businesses with its management style. Packard insisted that managers stay in contact with employees, and he practiced what he called "management by walking around." HP workers called him Dave, and they recounted stories that showed he was just one of the gang, not the wealthy owner of a leading technology company. "We wanted to direct our efforts toward making important technical contributions to the advancement of science, industry, and human welfare.… Right from the beginning, Bill and I knew we didn't want to be a 'me too' company merely copying products already on the market." Packard was fascinated by electronics at an early age. He built his first radio in elementary school and joined the radio club at Centennial High School. He also excelled in sports, playing football, basketball and track. In 1930, Packard enrolled at Stanford University to study electrical engineering. During his first semester, he met William Hewlett, another freshman at the school. They often took the same classes, but their friendship didn't develop until their senior year. The two men were different in some ways: Hewlett was short and stocky, Packard was tall and lean. Hewlett came from a wealthy family, while Packard worked in a local cafeteria to earn extra money. But they shared a love of the outdoors and electronics. In 1934, they talked about starting a business with several other classmates. That plan, however, was delayed when Packard took a job at General Electric (GE) in Schenectady, New York. Packard spent four years at GE, learning more about electronics and picking up management skills. He and Hewlett stayed in contact, and had their first official business meeting in August 1937 with plans to start a firm called the Engineering Service Company. Packard took a leave of absence from GE the next year, shortly after marrying Lucile Salter. Returning to Palo Alto, he began his partnership with Hewlett while taking classes and working nights. By the end of 1938, Packard and Hewlett had their first product ready for sale. They discovered that each partner had his own talents. As Packard wrote in The HP Way, "Bill was better trained in circuit technology and I was better trained and more experienced in manufacturing processes. This combination of abilities was particularly useful in designing and manufacturing electronics products." David Packard built his first radio using a vacuum tube—a common device in early electronic equipment—two batteries, and a few other parts. With this simple radio, he picked up a station 600 miles away. World War II (1939-45) fueled the company's growth. With Hewlett serving in the army, Packard ran the company. The HP plant operated all day long, and Packard often slept there on a cot. His wife also worked for the company, serving as a secretary and bookkeeper. Later, Lucile Packard bought presents for HP workers who got married or had a baby. Packard credited his wife with starting many of the traditions that helped make HP feel like a family. For decades, female executives have struggled to reach the top spots at major U.S. corporations. Some people claimed a "glass ceiling," put in place by corporate boards, let women see the opportunities available, but kept them from reaching those positions. 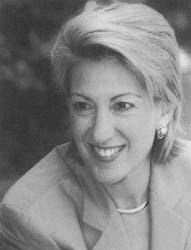 In July 1999, Hewlett-Packard helped crack the glass ceiling when it named Carleton "Carly" Fiorina its president and chief executive officer (CEO). She became the first female to lead a major high-tech business, and the CEO of the largest U.S. company ever run by a woman. In 2000, HP also made her chairwoman of the board. Fiorina was born in California in 1954. Like HP founders William Hewlett and David Packard, she graduated from Stanford University, although her specialty was medieval history, not electronics. She considered a career in law (her father was a judge), then worked at a number of jobs before earning a master's of business administration (MBA) from the University of Maryland. In 1980, she began working in sales for AT&T, then moved up the corporate ladder and earned a second master's degree in 1988. When AT&T formed Lucent Technologies (see entry) to make and sell telephone and Internet equipment, Fiorina took a top position at the new company. In 1998, she was named president of Lucent's largest group, and Fortune named her the most powerful woman in business. She won the honor a second time shortly after taking the job at HP. Fiorina's appointment won her and HP prominent attention in the press. She, however, insisted on downplaying her historical role as the most powerful U.S. businesswoman ever. Instead she focused on the job of adding spark to an old business while continuing the HP tradition. Fiorina faced resistance from some HP employees, as she came across as flashy and tough. Slowly, however, she won support from top managers and the board of directors. By 2001, however, Fiorina was still struggling to change HP. The battle to take control of Compaq raised questions in the media about Fiorina's commitment to the legendary HP Way. She told the San Jose Mercury News that the first objective of the HP Way was to make a profit, and that was what she was after. "If you don't make money," she said, "then all this other stuff isn't possible—you can't preserve jobs, you can't innovate, you can't contribute to the community." After the war, HP recruited new scientists and managers, and the business grew quickly. As the company expanded, Packard was not able to have direct contact with all the employees, as he once had. He and Hewlett decided to hold a two-day meeting with senior managers to make sure they knew how to treat customers and employees, and to let the managers help shape the company's goals. HP always encouraged its employees to be active in the community and give time to others. Packard's outside service included serving as chairman of the board of trustees for Stanford University during the late 1950s. In that position, he met Congressman Mel Laird. In December 1968, Laird was named U.S. secretary of defense by President-elect Richard Nixon (1913-1994). Laird then asked Packard to come to Washington to serve as his deputy secretary. Some people outside of government questioned Packard's appointment. He had almost no political experience, and HP had contracts with the military worth $100 million, raising the possibility of a conflict of interest. Packard, however, was easily confirmed for the job. While in Washington, he used the HP Way, meeting with military leaders and getting their input on budget cuts. He also set up new methods for purchasing military equipment. Packard served as the United States was fighting the Vietnam War (1959-75), a conflict that divided many Americans. Working for the Defense Department was difficult during those years, and Packard was often criticized by politicians and the media. He also found it hard to work with the government bureaucracy—the layers of officials who decide what gets done and how. Packard wrote in The HP Way that dealing with the bureaucracy was "like pushing on one end of a forty-foot rope, and trying to get the other end to do what you want!" 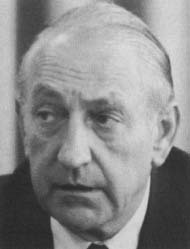 Packard left his position at the end of 1971, although he later served on several government commissions that addressed defense issues. Packard returned to Hewlett-Packard in 1972 and resumed his role as chairman of the board. During the next several years, he made two trips to China. On the second, Packard began a relationship with Chinese officials that led to a joint venture in 1985. During this period, both Packard and Hewlett were not involved in HP's daily operations. Their roles changed, however, in 1990, when HP faced a slowdown. Packard especially took a more active role in the company, helping to reorganize the computer operations. He finally stepped down as chairman of the board in 1993. Throughout his career, Packard was extremely generous, giving money to Stanford, the Monterey Bay (California) Aquarium, and the David and Lucile Packard Foundation. In 1988, he gave the foundation Hewlett-Packard shares worth $2 billion. After Packard died in 1996, the foundation received the rest of his fortune. Some of the money was used by the foundation's Children, Families, and Communities Program to help minority children. Packard used his scientific and business achievements to advance human welfare, just as he had hoped. Packard, David. The HP Way. New York: HarperBusiness, 1995. Allen, Frederick E. "Present at the Creation." American Heritage (May-June 2001): p. 21. "Carly Fiorina: Catching the Big Mo." Business Week (February 18, 2002): p. 46. "Compaq: Fiorina's Folly or HP's Only Way Out?" Time (September 17, 2001): p. 46. Hardy, Quentin. "The Cult of Carly." Forbes (December 13, 1999): p. 138. "Hewlett Explains Why He Opposes HP-Compaq Deal." San lose Mercury News (February 1, 2002). "Hewlett-Packard Chief Executive Discusses Battle for Merger." San Jose Mercury News (February 22, 2002). King, Peter H. "One Who Took the High Road." Los Angeles Times (March 31, 1996): p. 1. Lohr, Steve. "It's the Scion vs. the Board in Merger Fight." New York Times (February 4, 2002): p. C4. Nee, Eric. "Open Season on Carly." Fortune (July 23, 2001): p. 114. Saporito, Bill. "Hewlett-Packard Discovers Marketing." Fortune (October 1, 1984): p. 50. "$2 Billion Poorer." The Economist (May 7, 1988): p. 26. Weigner, Kathleen K. "Back into the Race." Forbes (October 10,1983): p.30.
. "Good-bye to the HP Way?" Forbes (November 26, 1990): p. 36. Zesiger, Sue. "Cover Girl Storms Silicon Valley." Fortune (August 16,1999): p. 29. Agilent Technologies. [On-line] http://www.agilent.com.org (accessed on August 15, 2002). Hewlett-Packard Company. [On-line] http://www.hp.com (accessed on August 15, 2002). Hewlett-Packard Company Home Depot, Inc.